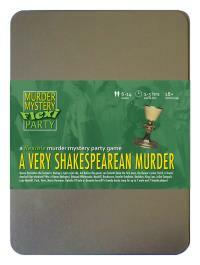 You've been invited to play the role of QUEEN DERIVATIVE II in A Very Shakespearean Murder. What scream through yonder window breaks? Queen Derivative the Second is having a right royal ado, but before the guests can forketh down the first oxen, the Queen’s jester Yorick is found dead-ed! Join us to find out who-duneth-it! Your sparkly high-collared dress has a skirt big enough to sweep all groveling subjects to the curb. Your small crown sits on a mass of orange curls high above your pretty nose. I’m Queen Derivative the Second but you can call me Queenie. Unless you’re particularly toady, in which case call me Queenie and I’ll chop off your head! I refuse to “Alas poor Yorick”. He’s completely spoiled my perfectly lovely party by getting himself killed and he was supposed to be making balloon animals later. Now the whole thing’s ruined! And don’t look at me. If I’d have wanted him dead, his head would be on a spike already!